Check out this awesome mockup featuring a woman's sweatpants against a flat surface, it's a really versatile image that you can use in a variety of different ways. Start now! Choose your background color, or even make it transparent, using the menu on the right side of the page, it'll also let you choose the sweatpants color. The menu on the left will let you upload your design and remove its black or white background too. Start using Placeit now and make your income grow! 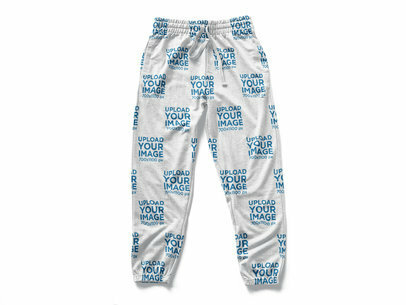 Try another Sweatpants Mockup here! 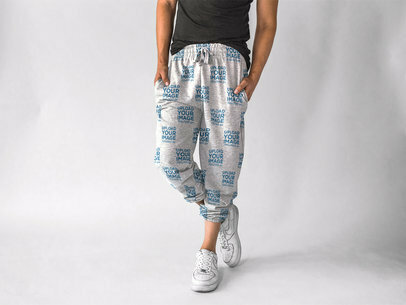 Promote your latest sweatpants designs with Placeit! This awesome mockup features a woman wearing sweatpants while standing in a studio, it's a really beautiful photorealistic visual that you can use if you are looking to promote your latest designs to your audience in a gorgeous way. Use the HEX tool on the right to choose the sweatpants color, and upload your design with the upload button to the left. Don't forget to edit the text above the upload button! Try another Sweatpants Mockup! Take a look at this gorgeous visual from Placeit! It's featuring a man with sneakers wearing sweatpants while at a studio, it's a really cool visual that you can use to display an amazing design from yours. Change the sweatpants color with the menu on the right, then upload a design and remove its black or white background with the menu on the left. Easy, right? Try another Sweatpants Mockup! Showcase your latest design to your audience in an awesome way, use Placeit! This great mockup shows a sporty woman wearing sweatpants while standing inside a studio. You can change her sweatpants' colors with the HEX tool on the right side of the page. Don't forget to edit the text and upload your design image file with the menu to the left. Start using Placeit to promote your designs and make your revenue grow! Try another Sweatpants Mockup! 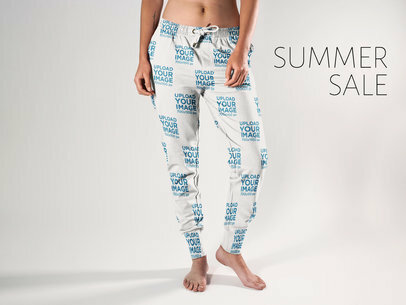 Showcase your latest design for a sporty girl's sweatpants with Placeit! This mockup features a sporty girl wearing sweatpants while inside a studio. You can use this image to promote your latest designs in a beautiful and photorealistic way. Start now! Choose her sweatpants' color with the menu on the right, then upload a design and edit the text with the menu on the left. Easy, right? Try another Sweatpants Mockup! Take a look at this awesome mockup featuring a smiling white girl wearing sweatpants while sitting down in a studio, this image is an excellent choice if you are looking to promote your latest designs in a beautiful and photorealistic way. Use the menu on the right to choose her sweatpants color, then drag n' drop a jpeg or png image file over the button on the left. Easy, right? Remove a black or white background from your design using another button on the left. Isn't it great? 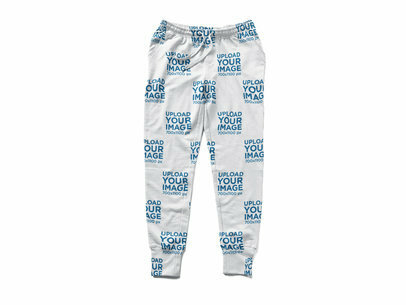 Try another Sweatpants Mockup! Start showcasing your latest designs for different clothes with Placeit! This mockup features a beautiful woman sitting down in a studio while wearing sweatpants, it's a beautiful visual that you can use to promote your designs in a professional and photorealistic way. Start now, the menu on the right has a HEX tool for you to choose her sweatpants color. Upload your design by dragging and dropping the jpeg or png image file over the button on the left side of the page. Try another Sweatpants Mockup! Start showcasing your latest designs with Placeit! This template features a man wearing sweatpants while standing in a white room, it's a really beautiful and professional visual that you can use to showcase your latest design for sweatpants. Start now, the menu on the right will let you choose a sweatpants color, then upload a design and remove its black or white background with the menu on the left. Try another Sweatpants Mockup!